It is early in the afternoon at this important port 125 miles from Athens and two Greek navy officers are patrolling the docks, each wielding sticks with mirrors to peek under trucks. They have seen nothing so far. Suddenly, three young men burst from behind a massive container and take off down a dock. The officers begin a chase, but the drama is over before it starts. Within a minute, the three men, faster and more desperate, have escaped into a dilapidated industrial complex. The men, says one officer, are illegal immigrants, who apparently spent the night on the dock hoping to sneak onto a ferry to Italy. They are part of a deluge of undocumented workers trying to reach Europe through Greece, and slipping past authorities is just part of the process. "Day in, day out, the same story," the officer lamented, trying to catch his breath. Greece, of course, is well-known for its role in the euro-zone crisis, with a massive debt load and sclerotic economy that threatens the single currency. But from Brussels to Oslo, government leaders are fretting about another issue that imperils the integrity of free access across an entire continent: porous Greek borders. The country quietly has become a steppingstone for a wave of Middle East and South Asia workers fleeing job markets ravaged by years of government turmoil. In 2011, an extraordinary year because of the uprisings in North Africa, 140,980 people were detected entering the EU illegally, up 35% from the year before, according to Frontex, the EU's border-control agency. 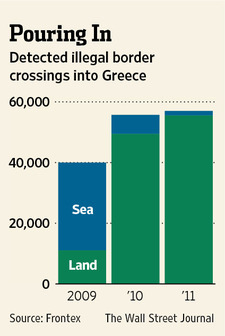 Of those, 40% came through Greece. Through July this year, 23,000 people were apprehended crossing the border illegally, roughly 30% ahead of last's year pace.